Do you or your students rely on test notes before playing? In a performance or an audition, every note is judged, and the ability to begin a piece confidently without playing additional notes after approaching the stage is a necessary performance skill. Long tones and isolated tone studies provide a lot of information about how we create our best sounds. When we remove the other variables of playing in context, we can focus on embouchure, air speed, vowel shapes, and more, and this process involves a high level of awareness. Quick test notes, however, can tell us how we actually respond under pressure when we're about to begin a specific piece, and how we may change certain things when approaching different musical contexts. If you begin a piece on a soft high note and go for a test note to make sure it will happen, your body is probably giving you a lot of information before you even begin. In my experience, I stop myself and realize that I've lost all sense of my head balance in relation to my spine, my throat feels more tense, and my thighs have started gripping! Next time you find yourself testing notes, pause and gather some information. Ground yourself in preparation to play, keep awareness on your feet and their contact with the ground while inhaling, and continue to notice through the first sounds. Do your feet attempt to leave the ground? Do you feel a sensation of pulling upward caused by excess tension and doing? Noticing if the feet feel less contact with the ground is a sign of the body gripping and pulling upwards. Do I Hold At the Top of The Breath? During your inhalation, do you attempt to help the body inhale by adding tension at the top of the breath? I feel the arms gripping over the ribs and a tense feeling near the sternum when I'm consciously gasping in air. To go from activating to a state of simply allowing optimal breathing, watch the journey of air, beginning with watching the air coming into the mouth. Lay on the floor to get to know the feeling, as the entire body can be supported by the floor while we observe. 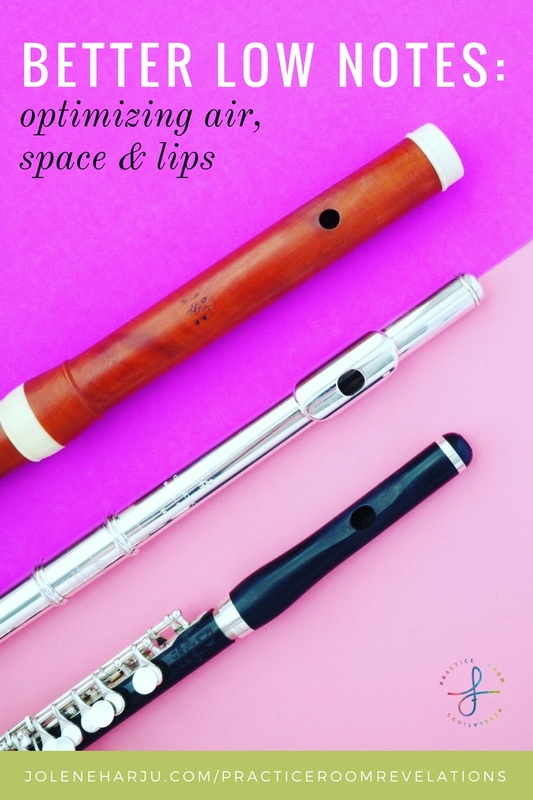 *The most important tip for beginning sounds with a free feeling in the body is to move slightly and fluidly while breathing and into creating sound. Holding the body in a rigid position for the breath and before the initial sound can reduce the feeling of ease and increase anxiety. Once the body has given information, notice what information the mind can provide when you play a test note. Does the test note involve the same level of mental imagery and preparation as an actual performance? Do you hear the same level of detail regarding the initial attack, intonation, vibrato, and color before playing? Overall, thinking musically and imagining the sound you want (in all its dimensions) before playing can alleviate the need to test the first. Thinking this way builds trust with your inner performer. If your test notes are aimed at the practicalities of creating sound, considering the intention of always beginning with a musical intention and cultivate trust with your inner performer each time you initiate sound in the practice room! What have you learned from your test notes? How do you cultivate trust with your sounds without playing a test note first? You put your instrument together, play a few notes, and things just aren't feeling or sounding right. You're cracking notes and struggling to find comfort. All of a sudden, your tone is gone. In an effort to sound better, you force your sound to come out. All in all, nothing is working, and it's frustrating. I'm physically tense, fatigued, or congested. I've just eaten something cold. My headjoint is slightly off the ideal mark. My flute has a leak. I've gone several days between practicing and feeling "out of shape." I've found that it is possible to come back and feel like nothing's changed. In some cases, I'm so refreshed and excited to play again that I sound even better than before. This week, however, my two days off were associated with guilt and fear because a deadline is looming only a few weeks away. When I came back to playing, I was nervous about having diminished my own progress and worried about how much work I still have to do. Before I even played a note, I was imagining my sound as being closed off and stuffy. I convinced myself I was out of shape, and I played that way. Before I began practicing, I told myself I was "out of shape." I played with the closed off sound I heard in my head before I even started. I heard my sound and confirmed I was playing poorly and without ease. I judged myself for taking two days off and began self-loathing. The frustration extended to my physical use, and I tried forcing sound out. More tension meant more frustration, more judging, and more self-loathing. The cycle continued until I became too frustrated to continue. I've recently been reading Indirect Procedures: A Musician's Guide to the Alexander Technique by Pedro de Alcantara. One of the first Alexander Technique concepts discussed is the principle of End-Gaining vs. Means-Whereby. "End gaining is the tendency we have to keep our mind and actions focused on an end result whilst losing sight of, and frequently at the expense of, the means-whereby the result is achieved." I'm discovering that this concept can appear on many levels, from the action of a single note, to long-term life goals. When it comes to sound, I was desperate for the end-result of "sounding better," and I found myself forcing sounds and feeling frustrated. I lost sight of the means-whereby. When I was first learning about the benefits of singing and playing in relation to support and optimal body feeling during grad school, Professor Amsler had me use ear plugs to turn attention to feeling rather than hearing. With the work we were doing to change and improve sound, the dramatic difference in tone from my ears often sounded strange from my own perspective: my sound no longer sounded big to me, because it was projecting and sounding big for the room. using ear plugs, the emotional response of hearing and judging can be replaced by feeling and observing. Since my sense of hearing caused me to end-gain, adding ear plugs re-directed my reliance on hearing and allowed me to include more senses into my approach. Can I Release the lower back and abdomen to allow freedom for breathing and support? Where do I lose support from the ground? What is the space between the teeth like? Singing and Playing naturally encourages me to notice optimal support within the body without forcing. Doing this with ear plugs is a powerful way to observe the body with greater clarity, and the first thing I lean on when I'm bringing my best sound back. After using ear plugs and lots of singing and playing, I was out of the loop of self-misery and enjoying a more resonant sound with ease! I could move on to a more productive practice session, feeling grateful for having worked through it! Want 20+ Ideas For Bad Tone Days? One of the first posts I wrote back in 2012 is called How To Cope with a Bad Tone Day. Does your awareness have a tendency to narrow as time goes on while practicing? I often begin with good intentions of feeling my feet grounding my entire body, but at some point, I lose full-body awareness and become only aware of what feels uncomfortable in the upper body or the notes on the page. Perhaps you've never considered the way your lower half influences the entire body while playing! Try the five exercises below while playing, and scan the body carefully for changes in tension and release, holding, or ease. Are you habitually standing with more weight on the heels or the balls of the feet as you play? Scan the body for changes as you slowly shift forward and back from the heels to the balls of the feet. Do you feel a change in the legs, the back, the abdominal muscles? Does the sound change as you play? I recently realized I felt quite locked and without breath, so I rolled from my heels to the balls of my feet, and felt a tremendous difference in my ability to play with freedom once I rolled forward from my locked position on the heels! Uncover which leg habitually receives more of your weight while playing. By slowing shifting your weight side to side while you play, you may notice changes all the way up the body. Do you notice a release and increase in space in the opposite side body? How do the ribs feel? Does the opposite arm change in effort? Does anything happen in the neck? Do you notice a change in your sound? Breathing? This elicits a change in resonance for me, and naturally allows the abdominal muscles to release, making breathing easier! Invite ankle movement by lifting the heels off the ground to the tempo. What is it like to watch leg movement while you play? Take the knees from locked to generously bent. Notice the relationship between the abdominal muscles and the muscles of the back. Going from the extreme of locked knees to bent knees, I notice just how much my torso and abdominal muscles release and allow easier breathing and resonance. Are you aware of your lower half and the relationship to the whole body while playing? Take the time to observe changes in the body while trying these 5 ideas during your practice session! Leave a comment below to share your own discoveries, or use #practiceroomrevelations and tag @joleneflute on Instagram! 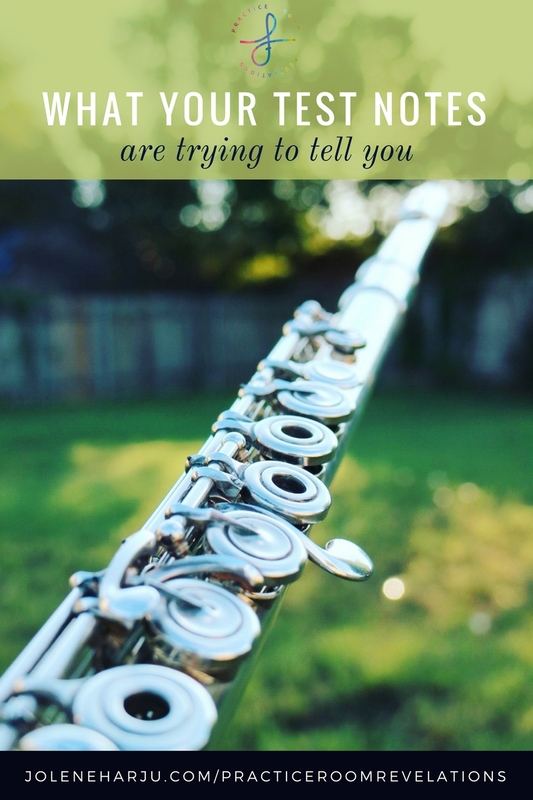 I recently sent my flute to the shop for a COA, and in the midst of preparing for upcoming events, I began thinking of all the ways I can continue to improve while it's away. You won't feel distracted or discouraged by a "bad tone day." You'll be able to focus purely on the composition and musicality. You'll have the opportunity to practice being mindful, present, and focused. You won't feel the temptation to mindlessly repeat passages and risk learning mistakes. Spend time researching your repertoire. Dig deeper into the life of the composer, important influences, the history of the instrument at the time of the composition, and so on. This is a crucial step is that is often cut short when tempted to get started learning the notes. There are boatloads of articles and resources available online. Even in five minutes of searching, you can learn something new! A heightened awareness of the background and context of a piece allows for an informed interpretation. If you're anticipating being without your instrument and can pre-record at least one performance of your piece, use your video as a tool for self-study. Watch yourself practice and take notes. Be your own teacher. This will be immensely useful in Step 3! Find as many recordings of your repertoire as possible, in addition to related works. Listen first as a whole, then on a granular level. Go phrase by phrase listening to all of your recordings back-to-back, taking specific notes. Oftentimes, we limit ourselves to only a few possibilities when playing. Hearing many possibilities from others opens your ears to fresh perspectives, and gives you the chance to determine which is the most effective. Once you've determined the way you'd like a certain phrase to be played, listen to your own recording if you pre-recorded yourself. Are you already playing it exactly as you want? Great! Now you've confirmed that you should keep playing it that way! Are there areas to improve? Great! Now you have a detailed plan. I've written a whole post on this process! Click here to read: Maximizing Improvement with Video Recordings. Make a copy of your music for personal note-taking. Write notes on your own playing while you listen to your own recordings, and add notes and ideas from your favorite recordings. Most importantly, add reminders throughout: Anticipate where you'll need to remember to "stand tall and sing" or "remain soft," for example. Use color to enhance the visual road map of your piece, and gain a visual of the bigger picture. You can also add color to imagine the tone color you wish to use in each phrase. Do you notice when you first play your instrument in the morning, the muscles tend to tight when taking a full breath? After warming up, however, the muscles become more mobile and breathing feels more free. Without your instrument, you have the opportunity to shift awareness to the full-body experience of warming up, rather than simply listening to your sound. Try stretching and movement exercises, notice patterns of tension in movement, and uncover an effective full-body warm-up to use before playing your instrument. Take the last step further by laying on the floor and observing the experience of breathing as a whole. Notice patterns of tension in the abdomen, the neck, the arms, the legs, and replace holding with subtle movement. Feel the movement of a full, efficient breath, and maintain effortless expansion while exhaling. Breath is the foundation of sound, so this is essentially tone practice without your instrument! Sing your part! Oftentimes, singing a note with a feeling of space in the mouth just before playing it on your instrument translates a beautiful, natural singing quality. Attempt to sing your parts with ease and beauty, and imagine how this feeling relates to your instrument. You can also practice hearing and singing intervals in tune! Actually practicing through imagination only. In addition to mental practice with the goal of learning notes and patterns, try a mental performance as well. Practice increasing your heart rate through jumping jacks or jogging in place, then come to a focused, grounded, and accepting state. The benefit of practicing mentally is that you can imagine yourself playing your best. Imagine physical ease, clear musicality, a luminous sound, and captivating presence. You can even attempt to memorize the notes and rhythms through mental visualization. How do you find ways to improve without your instrument? Let me know in the comment section below! While practicing recently, I noticed that I was feeling very tense - pulling upwards, and leaning into and over my music stand. Upon investigation, I realized how much my shoulders, face and throat were tensing. When instructed to open your throat, be aware that this can occur by either forcing openness or allowing openness. When I let go of my "smile" and allowed the face to drop, (not just the jaw, but the cheeks, forehead, ears, eyes, tongue, and corners of the mouth), my throat tension went away, and everything felt easier. This was especially useful in the low register. Releasing from a smile embouchure and allowing the corners to come forward toward the lip plate led to much more flexibility and consistency! Do you experience throat tension? Do you find that it occurs when there is more general tension all over the body, especially the head?